Founded in 2007 and licensed in Malta, Jetbull Casino continues to command online gambling attention as they maintain their immense versatility. The casino incorporates a variety of renowned software suppliers, covers several languages and has a full-bodied customer support. The Casino has a wide array of products which include; casino games, a competitive sportsbook, and lottery games. Jetbull Casino, having been in the gambling market for more than 10 years now, boasts of an unmatched selection of Casino games. With more than 12 software providers, Jetbull Casino offers an easy to navigate gambling platform with tabs at the top to give players access to live sports, virtual sports, live casino and other important links to promotion pages. The Casino offers amazing welcome bonuses and promotions to its players, has a high-end client information protection system and a robust customer support. Jetbull Casino provides an array of rewarding and thrilling progressive jackpots that are geared to ensure that all their customers have a chance to win big. The progressive jackpots include; Mega Fortune, Mega Moolah, King Cashalot, Treasure Nile, Hall of Gods and Poker Ride. Jetbull Casino offers an assortment of slot games that are meant to ensure that every client’s needs are met. The Casino boasts of providing some of the most prolific slot games in the online gaming world. Some of the slot games include; Starburst, Twin Spin, Jack Hammer, Steam Tower, Spinata Grande among others. Jetbull Casino’s versatility is unmatched. The Casino offers a wide selection of table games that will make the gambling experience fun and thrilling. The Casino’s renowned software developers have teamed together to bring an amazing assortment of table games that will capture your attention. The games include; roulette, blackjack, poker among others. Jetbull Casino offers two similar bingo games played 3 by cards. Both bingo games offer an option to buy more balls when a step away from a win and also provide a bonus game for covering a hectic period. The two bingo games are; Bugs Party and Flying Pigs. Jetbull Casino offers one of the most lucrative and rewarding Live Dealer Games. The games are tailored to make sure that the player enjoys the experience while in the comfort of their home. Some of the Live Dealer Games include; Blackjack, Roulette, Baccarat, Poker, Dice and many others. Jetbull Casino has a generous welcome bonus and is probably the best platform in rewarding its clients with unimaginable bonuses. 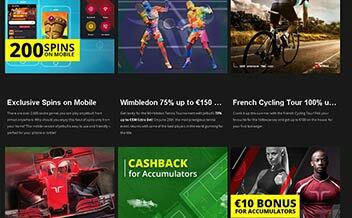 The Casino gives out 100% bonus on the first deposit up to 150€ or your preferred currency. The Casino also has a 10 sign up free spins on Stardust slot. 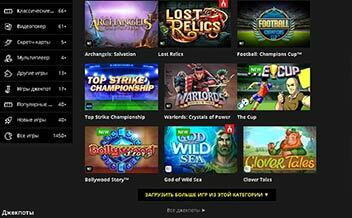 Additionally, the Casino has a 100% welcome bonus up to 300 plus 50 free spins on any one of NetEnt games. 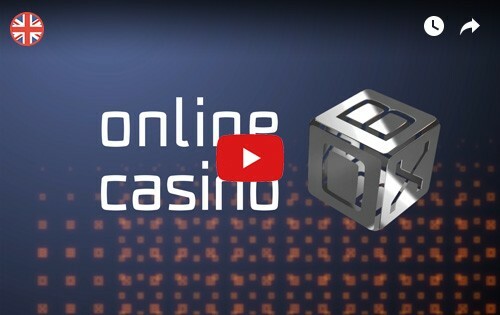 The Casino also offers a 35€ weekly bonus to its players. Both the welcome and the weekly bonus received must be wagered not less than 30 times to warrant a withdrawal. Staying updated on the latest developments regarding bonuses and promotions is very crucial for anyone looking to increase their chances of winning. This section is dedicated to providing you with the latest information about Jetbull Casino. Keep yourself updated by regularly checking out this section. Jetbull Casino offers a selection of secure methods to deposit and withdraw their earnings. They include; MasterCard, Visa Electron, InstaDebit Paysafe Card, Neteller, EcoPayz, Bank wire transfer, Skrill, Laser, GiroPay, Ukash, Instant bank and many others. Jetbull Casino restricts customers from a number of countries. These regions include; Belarus, France, Armenia, Belgium, Australia, Romania, South Africa, Portugal, Hungary, Spain and the United States. The Casino permits the use of the following currencies; USD, GBP, EUR, RUB, PLN, RON, KRW, ZAR, DKK, CZK, SEK, and CNY. The languages incorporated by the Casino are; English, Danish, Norsk, Romanian, and Русский. Jetbull Casino is available for its customers both in instant play and mobile devices. This makes it highly convenient as it allows players to enjoy playing their favorite games while on the move. The Casino supports its use on major browsers such as Firefox, Opera, and Chrome.  Jetbull Casino’s website has a distinctive and easy to navigate website. 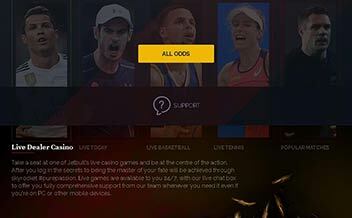 The website has tabs that help players navigate through the live sports, virtual sports, and promotional pages. The collaboration of 12 renowned developers has given rise to one of the most versatile and user-friendly online betting platform; Jetbull Casino. Jetbull’s desktop version is very much similar to the web version. Jetbull Casino offers one of the most remarkable mobile gambling experience. Both IOS and android phone players can enjoy the same level of thrill while on the move. Even more amazing, you don’t have to need to download an application, just type in the jetbull url, and there you go. Jetbull Casino has a strict policy on client protection and uses the renowned SSL encryption to protect all client interactions. This means that all the communications, gameplay and financial transactions are protected from any third party entity. The Casino is licensed and regulated by the renowned Malta Gaming Authority. Jetbull has a fairly great customer support. The customer support agents are amazingly knowledgeable and friendly and can be reached through email and through the live chat bubble that is available on every player’s page. Jetbull is an outstanding Casino offering a wide selection of games both in virtual and live dealer options. The Casino boasts of a wide range of thrilling Casino games that are as a result of an amazing 12- developer collaboration. The Casino has an amazing customers support and high-end client privacy protection policy. Join the Jetbull family today and enjoy these amazing perks!